We talk about maximizing space a lot on this blog. Often, it’s possible to come up with a more elegant solution to a problem rather than simply continuing along the status quo. In many cases, people have many more clothes than they wear with any frequency. Many people fill up their closets and dressers with this surplus and then are surprised when they are out of space. Why have a dresser when you have a closet? The amount of space in your bedroom can be expanded by trimming down the amount of clothes you have to just those that fit in your closet. Trimming down on the need for bedroom furniture makes space for more creative items. 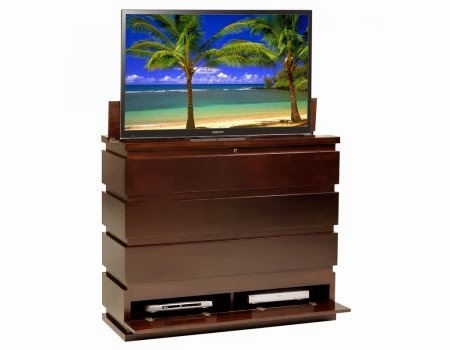 For example, you can replace the dresser with a TV lift cabinet or foot of the bed lift. Keeping an unsightly television stored until you need it is a great way to improve the usage of space in the room, not to mention the aesthetics. Many people put their bedroom TVs on top of their dressers, but this is obviously not the best use of space. These cabinets typically aren’t designed for the weight, nor do they protect the TV from being bumped or jostled when walking by. With new, lighter LCD and other flat-panel TVs, it’s more and more likely that a light bump will knock your screen loose. If a dresser is not really necessary, it’s possible to explore different options for your bedroom. Why not look into more creative ways to utilize the space and while protecting your TV from damage? The Prism TV Lift Cabinet, seen above, is a great choice for your bedroom and keeps the look of a dresser. It’s even possible to custom order a TV lift cabinet that matches the color or finish of your existing furniture. If matching the current aesthetic is not a priority, it’s even simpler to find a TV cabinet that complements the rest of the room and serves as a centerpiece.